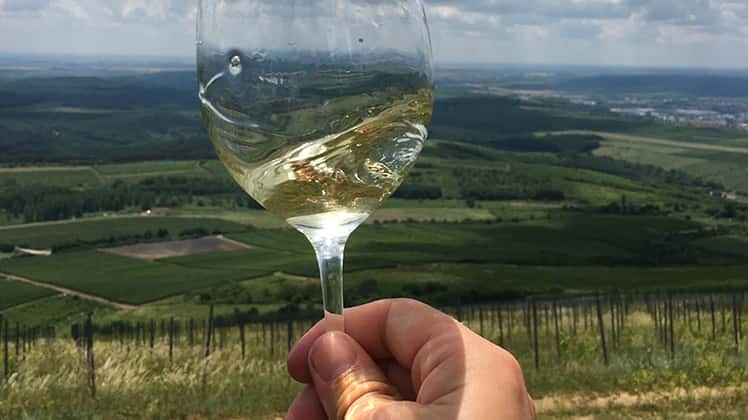 Rosie Allen and Freddy Bulmer taste the new vintage of our Society's Grüner Veltliner, talk all things natural and find out why organic is not always best. 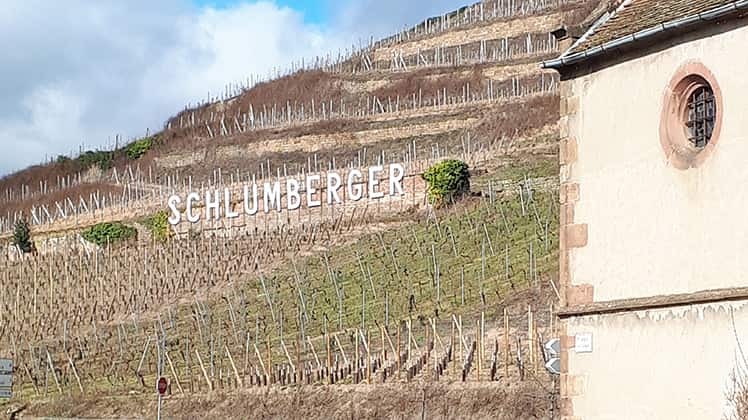 So, following our night and morning at Schloss Gobelsburg, we were off on our travels again to visit two wineries who reflect this revolutionary approach to winemaking in a very cool way. 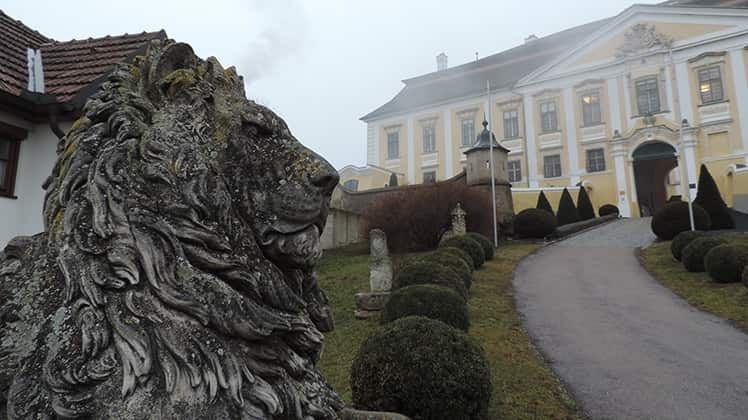 First, we made our way to the Stadt Krems region to visit Stadt Krems, the clever lot that craft our iconic Society's Grüner Veltliner (aka the wine that will wean everyone you know off New Zealand sauvignon blanc. It's really that good). Stadt Krems itself is a slick, modern winery neatly tucked among the handsome stone-clad buildings of the university town of Kremstal. Despite the sleek chrome-embellished interiors, it's actually one of the oldest wine producers in Austria, lovingly brought up-to-date by the effervescent Fritz Miesbauer and a dynamic young team of winemakers (read here for more history on the place). One of these bright young things is passionate winemaker Peter Rethaller, who showed us some mineral-streaked whites from the new vintage. But, we were all waiting for the main event; tasting the latest vintage of our own-label grüner. Happily, this glass full of ripe-pear, fresh-apple and white-pepper-tinged deliciousness didn't let us down, and Freddy was more than happy to snap up another batch. 'The Society's Grüner is great' he says 'because it's a charming, crisp and zippy white wine with tons of personality for the price-tag. Austria is super-consistently good and this shows how awesome entry-level grüner can be. 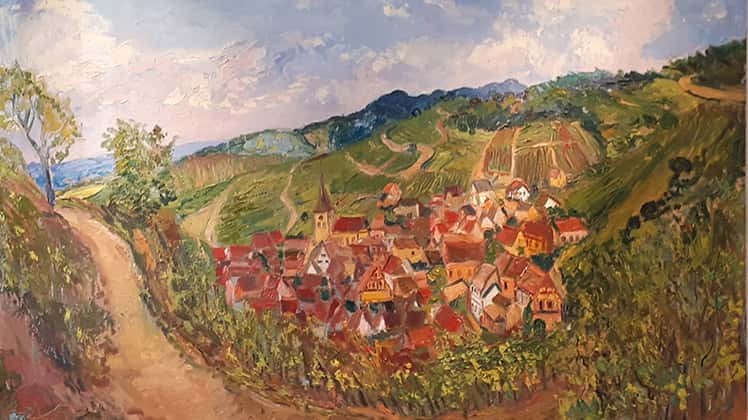 Stadt Krems make excellent quality wine, are superb people who allowed us to work with them to find the best possible wine at the right price for members'. If that doesn't convince you, a sip definitely will – pick up the latest vintage here. After a brief chat with Fritz himself we headed to the local tavern, a cosy Tudor-style building with dark-wood panelling and the smell of strudel wafting enticingly through the door. I remember what happened next as a dream-like segment in which everything that is clichéd and brilliantly Austrian came to pass; waitresses in dirndl dresses and milkmaid plaits handed us steaming plates of fried schnitzel, potato salad and sauerkraut; glasses of chilled grüner were poured; and manager of Stadt Krems, Franz Josef Gansberger regaled us with revelations and stories about Austria's winemaking past. Full of schnitzel, we made our way to the next stop of our itinerary – Kamptal, and the winery helmed by father-and-daughter team Rainer and Christina Wess. Tucked away in a former monastery building in Sandgrube, Krems, the Wesses are doing truly fantastic things with riesling and grüner here, filling each bottle with remarkable purity and character. 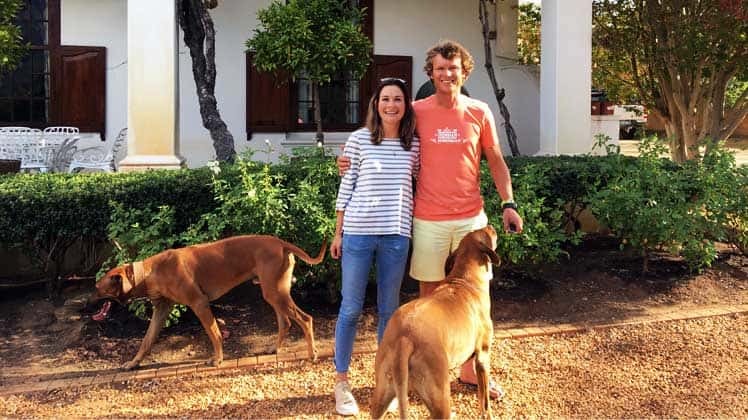 The Wesses are staunch believers in a minimal-intervention approach to winemaking, avoiding over-use of chemicals in the vineyard, allowing the unique soils of their vineyards to express themselves by a holistic nature-first approach to viticulture. However, they aren't certified organic and don't strive to be. 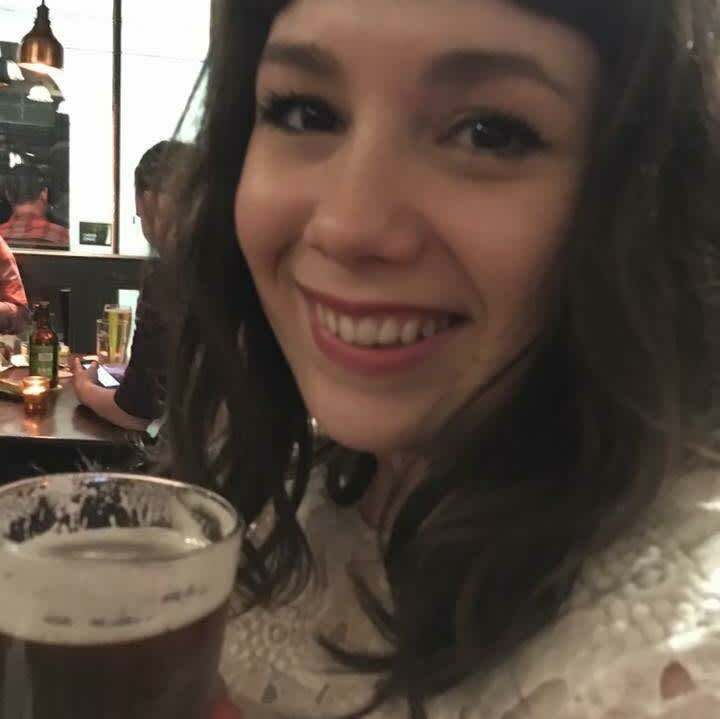 Christina explained: 'We think that organic winemaking isn't always the best for our environment and not always the most sustainable way. 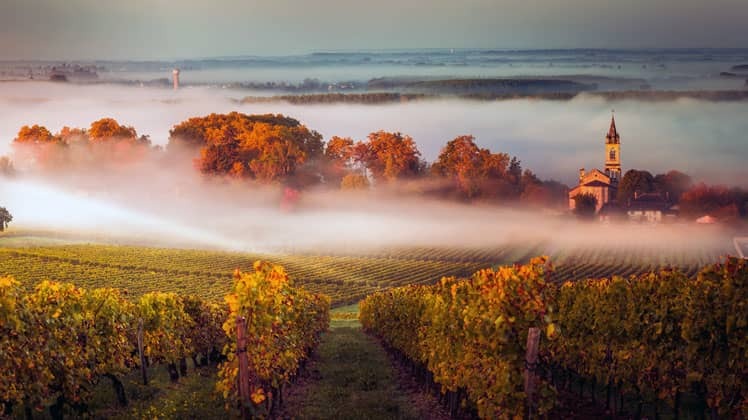 For example, we think that it is better to use a 'chemical' once at the right time (a process that isn't allowed for organic certified wines), instead of loading on tons of copper (which is bad for our soil yet allowed under certified organic practices) into the vineyards every second day during the spraying period. Today everything is categorised as good or bad/black or white, but we think that decisions in the vineyard run across every shade of grey'. 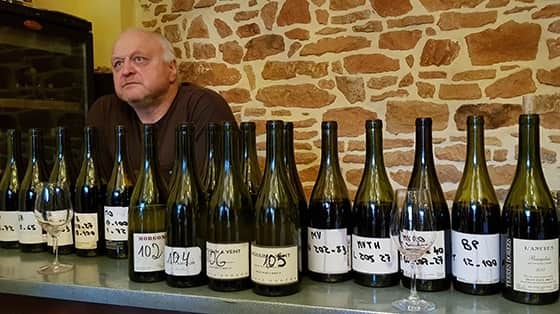 Rainer is also a big on supporting natural yeasts during the fermentation process, which give his wines a gorgeous rounded-yet-mineral quality that was unlike any others I tried on our trip. Freddy seemed to agree, and snapped up several wines from this revolutionary winemaking duo. 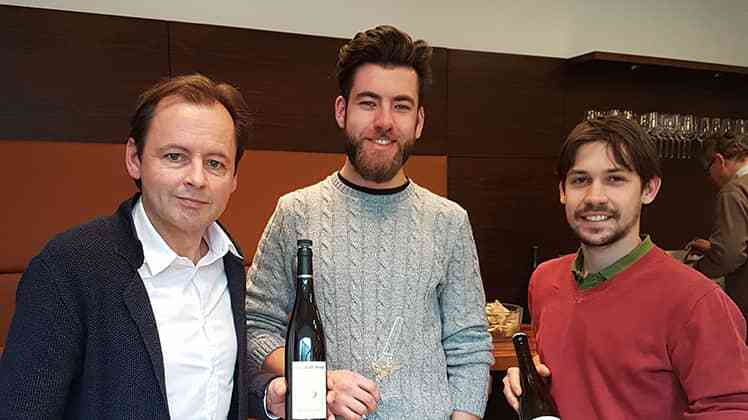 The conversation around natural wine really gets Austrian winemakers fired up; everyone we met had strong views on it, heated debates in restaurants revolved around it, and the fates of some winemakers may rise or fall by it; it's what an irritating marketing type might call an 'industry disruptor'. One wine-scene mover-and-shaker we met dismissed its popularity entirely; 'it's a fad that's already had its day in Austria and is just moving throughout other European countries. It won't be a 'thing' by next year' he said confidently. Others see it as a serious threat to what they do, offended by the concept of a movement that defines itself by its 'otherness', and by implication labelling non-natural wines as un-natural, corporate… in short, not the real deal. But a handful of winemakers are wholeheartedly embracing the injection of fun and excitement it's given to the country's wine scene, which brings a kind of punk kudos to those embracing a low-intervention lifestyle. In fact, some of the best winemakers we met were redefining the term entirely to reflect the low-intervention, rootsy approach they have been taking to winemaking for many years. Gerhard Pittnauer is one of these winemakers. His sleek 60s-inspired winery is a stark contrast to the stately beauty of Schloss Gobelsberg; part Don Draper's Manhattan office, part art student lair, the über-cool atmosphere reflects the avant-garde approach that Gerhard takes to his wines. 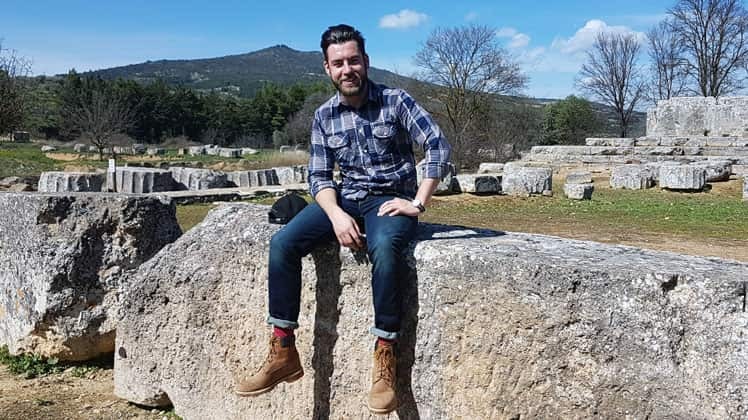 It also belies the decidedly non-hipster way he started his career, and the staunch commitment he makes to protecting the environment with his viticultural practices. Gerhard took over his family estate at the age of 18 and is completely self-taught, learning the skills of his trade on the job. He uses his experience to run the estate on biodynamic principles, rejecting chemicals and using herbal alternatives to keep his vines healthy, and using natural, ambient yeasts in fermentation. So far, so natural. But Gerhard doesn't just specialise in funky, fuzzy oddities (although he certainly does that too). We were treated to a tasting of some sleek, complex pure-tasting reds that absolutely blew us away, some of which we currently sell (take a look here). Gerhard also gave us a taste of his answer to the Pet Nat phenomenon: 'Pitt Nat' (see what he did there? ), with a theatrically explosive un-corking in his garden. Pet Nat stands for pétillant naturel, in which the wine is bottled before the first alcoholic fermentation, so CO2 is released naturally into the wine, and Gerhard's version was a fruity, floral, almost-bubblegum explosion – you can certainly see why it's caught the imagination of natural-wine lovers in Austria. "I have been buying and drinking Austrian wines for the last 20 years. There have been enormous improvements and there are many super vintners producing excellent wines. I hope that the Wine Society will start to look at the Thermenregion south of Vienna. No one imports from this region which is where the Viennese shop as well as Carnutum and south Styria. I am happy to help and point buyers to some really interesting discoveries. 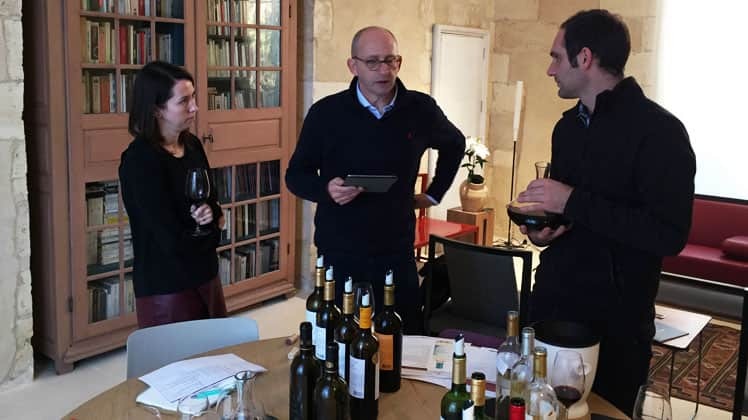 Peter... Read more > Gieler"
"I absolutely agree with Mr Gieler, we have been drinking exactly the wines in the mentioned areas for over 50 years!" "Would certainly be nice to see the Society stocking some more "natural" wines (and not only from Austria). You're a fair way behind the curve on this one :-)"